Can you guess the one thing that most elite athletes have in common? Children who specialize in a single sport account for 50 percent of overuse injuries in young athletes according to pediatric orthopedic specialists. In a study of 1,200 youth athletes, Dr Neeru Jayanthi of Loyola University found that early specialization in a single sport is one of the strongest predictors of injury. Athletes in the study who specialized were 70 to 93 percent more likely to be injured than children who played multiple sports. Better overall skills and ability: Research shows that early participation in multiple sports leads to better overall motor and athletic development, longer playing careers, increased ability to transfer sports skills to other sports, as well as increased motivation, ownership of the sports experience, and confidence. 10,000 hours is not a rule: In his survey of the scientific literature regarding sport specific practice in The Sports Gene, author David Epstein finds that most elite competitors require far less than 10,000 hours of deliberate practice. Specifically, studies have shown that basketball (4,000), field hockey (4,000) and wrestling (6,000) all require far less than 10,000 hours. There are many paths to mastery: A 2003 study on professional ice hockey players found that while most pros had spent 10,000 hours or more involved in sports prior to age 20, only 3,000 of those hours were involved in hockey-specific deliberate practice (and only 450 of those hours were prior to age 12). Editor’s note: This article first published on February 18, 2015. In my opinion, this focus on children specializing early comes primarily from the fact that kids sports have gone from being non-organized recreational activities that kids did on their own with little to no supervision until high school to industries looking to make money off of little kids and their parents. 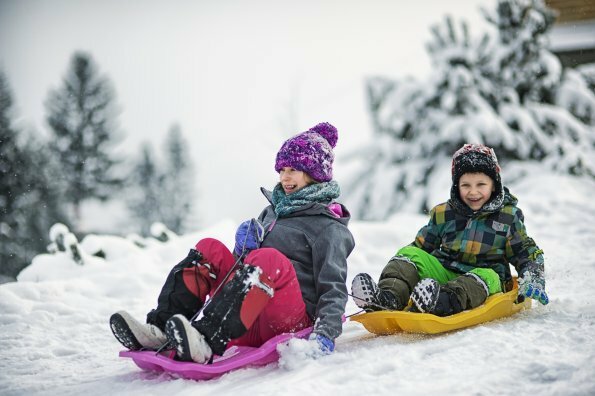 20-30 or more years ago, kids did whatever activity the weather outside permitted. If you lived where it snowed you skated on ponds or adults flooded back yards and/or parks and anyone who could get their hands on a pair of skates and a stick went and played hockey or figure skated. When it got warmer, kids would toss and/or kick balls back and forth in backyards, vacant lots, quiet streets & parks. Or biked back and forth popping wheelies or heading to the corner store. If there was enough space kids created their own baseball diamond or goalposts and the game was on with whoever showed up. Inner city kids would more likely have concrete parking lots and a hoop, so basketball proliferated. All participation required was minimal equipment and a few other kids. They didn’t even have to be friends. Just a body and a willingness to participate were all it took (that and the fact that your mom didn’t want you in the house bothering her until dinnertime). Nowadays, parents are over-scheduled and so are the kids. 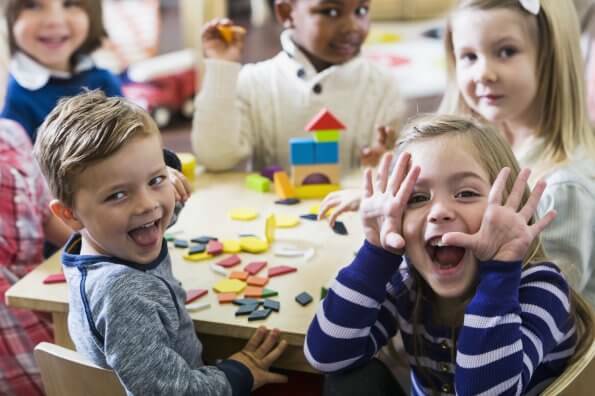 Kids in many places are not allowed to remain unsupervised for almost anytime, and so kids are placed early in organized activities to promote socialization and team building. Then come the clinics. Do this clinic and gain a competitive advantage for team selection when its time to sign-up for the next year. House teams versus rep teams starting earlier and earlier, and making the cut versus being cut. Give your kid a competitive advantage and sign-up for hockey clinics in the summer and/or futsal in the winter. Any activity can now be done year round and heaven knows these facilities have to justify their expense and the people and companies in the industry need to find year round gainful employment & income. That and the increasing fear that one’s kids need to be given every competitive advantage to survive in the future economy where gig jobs are becoming the norm and an assured middle-class income & affordable house are increasingly not a given. It’s a self-perpetuating endless loop. In my opinion, young children should have the chance to experience all sports before they pick a certain one to experience with a little more. They absolutely should not be forced into a sport that they are not certain they are going to be playing throughout their whole childhood. Kids should be able to play as many sports as they want whether they be playing a high level or not. They should have the experience with every sport until they have to pick a route to take while playing in university or college. Kids are often forced by their parents to pick one sport because of financial problems that they could be having. These kids are limited to the amount of sports they can play each year meaning they can’t explore all of the sports that are out there. I feel it is necessary to let the kids choose what sport they would like to pursue in. If kids are forced into a sport they would get sick of it when they grow older and it becomes more competitive and takes up more time in their life. 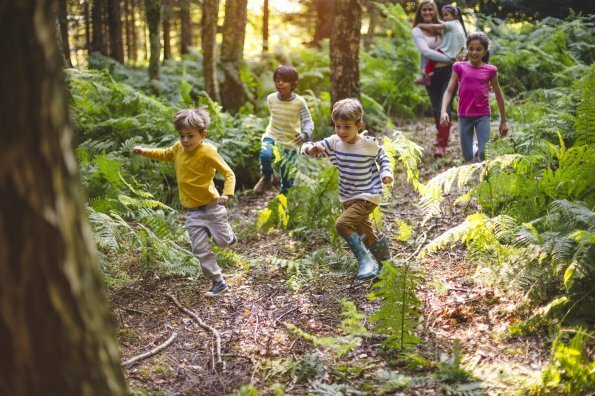 Children struggle to participate in more than one sporting event when they’re older because you tend to be more active when you get older and therefore play more games causing them to struggle with other activities outside of sports. By playing a variety of sports when you are younger, you tend to be more active as an adult thus living a healthier lifestyle and increasing your life expectancy. What an intriguing article! It’s interesting that there’s also medical and scientific backing to the argument, where a child is more likely to experience overuse injuries from only playing a single sport. However, the article didn’t seem to talk much about the child’s interest. What if a child is interested in specializing in a sport? Or is the article referring to parents forcing their children to specialize in a sport? The issue of specialization should be up to a child. A parent should not have the vision of “Oh my child will become a world-famous soccer player if they go to this academy!” but rather if a child wants to pursue a sport, then the parents should tell them about the work that must be put in (and that the work may not always be fun), and support them. Also, it seems like specialization is on a spectrum rather than discreetly on a basis of “you are” and “you aren’t.” Perhaps a kid wants to focus a bit more on one sport, but it doesn’t mean that they want to dedicate their lives to it. If someone is interested in gymnastics, sure it may require early specialization, but that does not mean that they can only do gymnastics, can only dedicate themselves to gymnastics. Maybe the child only does gymnastics recreationally, for fun. It still requires specialization, but it’s not the image of tiger parenting for 4 hours a night in a gym. More often than not, kids do not go on to make a career out of sports, but keep it as a hobby, so why not just allow the kid to enjoy the sport, why push and force the kid to become the best of the best? Like the article said, to have a child specialize in only one sport and push to train makes the sport no longer enjoyable. If a person loses their drive and motivation for the sport, was all that work and effort worth the outcome? Worth the time? Worth the loss of an enjoyable and memorable childhood? Recruiting multi-sport athletes is great, and sure colleges are still recruiting single-sport athletes, but the world seems to favour those of many interests. This may be concerning for athletes who are still very passionate for their single sport, and train lots for that single sport to become very very good, but the multi-sport athletes are preferred. This starts to become an issue similar to how colleges are more likely to accept a person of colour with lower grades over an asian with high grades, otherwise known as affirmative action in the USA. This is made particularly clear in the eighth paragraph where they interviewed Pete Carroll, where Carroll asks potential recruits about other sports they play, and how he wants his college-level players to play at least two sports as well. Perhaps Carroll just wants a versatile and adaptable player, but would that make things tough for an applicant who has trained and dedicated all their life to a single sport, pouring their hearts into their soul passion? The article also speaks of how during off season of a child/teen’s primary sport, they should be playing other sports to not just keep in shape but to also learn other transferable skills. This is a wonderful idea and keeps the child/teen involved, but again, it should be the decision of the child/teen. If they do not wish to play, it should be their decision. Of course parents should make them try it out and encourage them to keep going with it, but if after trying and they do not seem to enjoy it, they shouldn’t keep their kid in it just to say that they’re a multi-sport athlete. Overall, just let the kid choose. If a kid wants to become a world-famous soccer player, guide them along the path to success, but if they don’t wish to continue, don’t force them! If they want to play recreationally, allow them that choice. It’s their life. After reading this article, I can reflect on this as I’m against specializing in a certain sport at a young age, I believe it is very important to diversify yourself and have fun when growing up. I believe most kids should play a certain sport for a majority of the time and focus on that, but then they need an off season where they take advantage of time relaxing but also taking advantage of other sports they enjoy playing. In the article it talks about sport specific training and which sports help reflect in the other, I think that is important but not necessary because I believe kids at a young age should play sports that they enjoy, not ones on which are forced onto them. The prior section relates to young kids specializing in sports, and how I don’t believe it is appropriate at that age, but I do think there comes a certain point in their life when kids do need to focus mainly on one sport. With saying that it doesn’t mainly say leave those other sports completely but focus more on the other one. For example myself being a hockey player at age 17, I focus mainly on that with ice time reaching about 8 hours a week, and gym time usually 4-5 hours, this drains your body for the season, so therefore in the summer I take some time away from the game but I also still train 3 hours a week, while trying to stay in the gym daily. With all that I still have time to work and make money while in the summer I also golf 2-3 rounds a week, and play pick up soccer with friends. I do this so I’m not so worn out and it builds a better mental picture, mental clarity is a big part in sport because if you are not fully committed you will be worn down very quickly. With all this I still was able to play school sports such as golf, badminton, and tennis because those are sports I enjoyed playing and representing my school in. With all this being said my point is basically that you shouldn’t specialize in a sport until an age where you know you are ready and when that is the sport you really enjoy playing. For myself this didn’t come until about age 15, before then I was playing upwards of 8 sports a year. I believe that there is merit to all aspects of specialization. Forcing children as young as five to specialize in a sport, I believe is ridiculous. I am a firm believer that young children should be encouraged to play as many sports as possible but not forced to participate. I know from personal experience that playing a sport year round leads to burn out and lack of drive to participate. There should be no age at which a child decides to specialize. I think that as soon as the child is old enough to make their own decisions and express an interest in the sport they should be able to play it as much or as little as they would like. if a twelve year old, for example wants to play hockey all year and nothing else, they should be allowed. Mind you they should also be encouraged to try other sports at school or in the off season as a healthy reminder from their parents. Never should the sentence, “You can’t play because you are to young to specialize,” ever be mentioned. I find this study thought provoking how a college study can spark debates about specialization in young children. I understand that athletes need time to develop but most children are not going to be professionals in their respective sports and play for activity, social aspects and for their own enjoyment. This being said, children should get to choose how much they play and if they play multiple sports. Chances are a real athletic child will vary their choices and pick to play in many sport areas. Looking at a different aspect that all children need to specialize at some point. They should specialize at the age required in order to succeed in the sport. I agree that in order to be a professional specialization needs to occur. Specialization should only occur if the child is going to attempt to play professionally. Even with the specialization into a sport there are many different platforms where other sports can still be played at a recreational level. For example, I am a competitive curler, that is provincially, nationally and internationally ranked, so that is my main focus. But on other platforms like high school and during the off season, there is time to get a change in sports and play volleyball, badminton and baseball. Even in those sports you can play at a competitive level. Its all about time management. As long as those sports are not high risk or something that would jeopardize the future of the sport the athlete specialized in. I would agree with the accuracy of this article. It brings up the flaws in our youth sporting agencies where the focus seems to be on everyone making the big leagues and pushing athletes to be one dimensional. Most athletes require variation and should play more than one sport in order to enhance other skills and formulate different viewpoints. It ultimately should be up to the athlete, their commitment level and what they enjoy. No child should be playing a sport they feel forced to play or have no motivation to succeed in. A down side to early specialization which I did t see mentioned is it’s impact on non-specialized kids. By the time my son had warmed up to trying soccer he was 10 and “too old” to join the neighbourhood league. To have him play at his level meant going in with much younger kids and he wasn’t keen on that, if they did allow it. In swimming lessons he was usually the oldest in his class (as was his sister in hers). Luckily it doesn’t matter as much in swimming and not at all in taekwondo (where they both shine). I agree that an all rounded athletic kid is great, but how can they enter into sports where the other kids have had years of experience? Jan, in the case of soccer there should be a recreational league accepting all level of skills and allowing participation regarding the experience level. Club level is a different thing since there are try outs, but if your son has interest he should be able to play, I do not know why you said that he was too old. He may has less skills than the other kids but he should be able to have fun,learn and improve his game in the process. I’m sorry. While I agree that this is the case in many sports, soccer (in addition to many other sports) is an exception. You picture is highlighting one coach’s recruiting program. And the NCAA stats are relatively aligned with his numbers for football. However, not all sports are nearly the opposite. Football is based on athleticism. It is based on size, strength, agility and speed. The primary psychomotor skills are translate-able with other sports. In fact, there are many who play in college who never played the sport until they were in HS. However, soccer is a unique sport. It is also about agility and speed (for the most part), but the primary psychomotor skills in soccer are extremely unique. In no other sport are you required to manipulate a ball (other than basically kicking it) like soccer. The touch required to control a ball takes thousands of hours to develop. Juan above is absolutely correct. It’s not to say that there aren’t multi-sport athletes that play college (or pro soccer), but the NCAA reports that 68% of DI men’s soccer players and 62% of DI women’s soccer players were one-sport soccer athletes by 12. Conversely, to your point, the NCAA, reports 71% of DI men’s football players were multisport athletes, 88% of DI men and 83% of DI women who play lacrosse also played other sports, 87% of DI female runners and 91% of DI male runners were multisport athletes. Those numbers tell a very important story. The truth is that we, in the US, are ignorant of the level of commitment required to build elite soccer players. Yes, our women dominate the sport. But our men struggle to even come close to compete on the world stage. Clearly our model isn’t working. Forget the fact that we didn’t qualify for the World Cup. Do a search for the top 100 mens soccer players in the world. Depending on which list you see, we may be lucky to be represented by 1 player, Christian Pulisic. Given the sheer volume of youth players at any given time playing soccer in the US compared to any other nation in the world, and that is a disgrace. I whole-heartedly agree that multi-sport participation needs to be pushed at younger ages. At younger ages, every thing is about deliberate play where young athletes are just focused on playing and having fun. Learning the sport is less important than simply learning fitness, teamwork, and sports in general. However, at some point, to become an elite athlete in soccer, there must be a commitment to deliberate practice. For some athletes, they can do this as well as other sports. In fact, in 42 states, HS soccer is played in the fall, so many soccer players will run track in the spring and are quite gifted. In the other 8 states, cross country is the sport that most soccer players commit too. But most athletes start to specialize earlier in soccer, due to the demands to keep up with their peers developing their technical skills and tactical understanding of the game. The bottomline is that the multi-sport solution is not the “end all, be all” for all sports and it’s not necessarily correct for all athletes. You make good points – all of which need to made. And parents need to understand all the facts. But when to specialize is not remotely settled for any sport. Every situation is different. Every athlete is different. And as I pointed out, for soccer, specialization (according to the NCAA D1 stats) is primarily taking place around 12-13 years of age. A very intelligent response. All sports are different and to compare Soccer and Football is silly to think the development is the same. Think of Soccer as learning a new language. The younger you start and the more time spent practicing the better you get. Overuse injury is more to do with too much competitive game exposure and poor planning. By all means parents have your kids play whatever sports you think is wise but dont think of soccer as a part time sport and expect to play at the top level. Look at the best nation per capita which is Uruguay and ask Luis Suarez how old he was when he started specializing and which other sports he played when he was a kid. Thanks a lot for sharing this informative article. It does make perfect sense that if you want to excel in one sport, that you should try and be good at others. That way, they can play off each other and overall, you’ll get better in all of them. I do agree with you that youth sports should encourage multi-sport participation. I’m sure that if more places did that, you’d have a lot of people breaking records left and right! I am from Southamerica where soccer is the king. I am very surprised with the multi sport model of US applied to soccer development. In most of the world kids play soccer since they are 3 years old and are obsessed about it. Those that made it pro, only played soccer since they started walking. How would you explain then that when going at the international level in soccer the multi sport model fails in comparison with the only soccer model. Thanks! There’s nothing to explain. Gareth Bale did athletics, field hockey, and rugby alongside soccer as a kid. Does he fail at the international level? Several English players were standout cricket players in their youth. Sweden’s Ibrahimovic was great in martial arts (largely accounting for some of his incredible bicycle kick and scissor kick goals in soccer). In the women’s game, Christine Sinclair and Abby Wambach played multiple sports in childhood. However, you make a good point that is becoming clear to many in the soccer world: soccer is starting to be identified as an “early introduction” sport — which basically means you will go further in the game if you are introduced to the sport early (obviously, only if you like it) and therefore start developing skills early. HOWEVER … this doesn’t mean that soccer players don’t benefit from playing other sports at the same time. Lots of today’s top professional players were and are multi-sport athletes. Jim, thanks for your reply. I agree with you that soccer players would benefit from playing other sports. You are mentioning specific examples of top soccer players that did other sports and were successful. This article here basically says that most elite athletes were multi-sport athletes. My point is that it may be true in US, but when you go to the international level and specifically in soccer, that is not the case. Look just into the national soccer teams of Brazil and Argentina and I can assure you that at least 95% of the players grew up playing only soccer. Let me also give you a few examples of “only soccer” player, Maradona, Messi, Aguero, Neymar and Pele. In countries like Argentina and Brazil, early specialization in soccer is not new, it was always the norm. If the multi sport model for soccer players development would be successful, US should have more world cups than Brazil. Actually this is true for gymnastics too. It does not require early specialization, but just attracts younger kids. I know elite gymnasts who started in college and I myself am an elite gymnast who started in high school. We may not be olympians, but we compete internationally, and are pretty f*cking good. Good article. I was a multi-sport athlete in high school. I was an All-District, All-Conference, All-Metro tennis honoree. I was also Academic All-State Basketball. It helped me get a full ride to a university. I played tennis in college. In high school, I had a very driven basketball coach, who actually was my elementary school PE teacher, too. He put a basketball in my hands when I was 5. By the time we were in high school, he expected us to play basketball 10 months a year. If I wouldn’t have played tennis, I would have been urged to play basketball 12 months a year. By the end of my high school senior year, all but one other senior had quit the team. I only stayed on because there would have been a deep chasm in the ‘bench’ if I’d left, and we’d won our District Championships for 13 years in a row. I didn’t want to be the reason we lost District. [We won District.] I went to a high school with a student body of about 2500, so it wasn’t a small school. Here’s the rub: I think coaches, even at the high school level, are paid more money if they win their District, their Regional, and their Sectional tournaments, and then make it to the final 4 at State. So, I don’t know that this phenomenon of one sport-tracking will stop as long as the high school coaches are paid more to win. They aren’t paid well anyway, so more money is definitively an incentive. These coaches tell parents that if the kids don’t play almost year round and summer ‘ball’ that we won’t have as good of chance of making the team or being on the starting team. Although, actually, the summer leagues were fun, because a volunteer coach (my dad) coached, and everyone got to play. The university that hosted summer leagues *refused* to allow any regular high school coaches to coach summer ball, which I think was very wise. After all that, the high school coach still played who he wanted anyway. If I would recommend anything to parents, other adults, teens, and children reading this, it would be to pick another sport in addition to your main sport that is a “lifetime” sport, such as golf, tennis, swimming, etc. You don’t have to be the best at both or all sports. But you become more well-rounded, make more friends, and have a good psychological break. I play mostly doubles tennis now, but it’s still fun. Even though I’m active, I don’t play full-court basketball anymore. I guess I could play half-court, but it’s harder to find player than in tennis. I could shoot around I guess, but I’d rather play tennis. I know of men who have heart attacks on the basketball court from over-exerting themselves when they are older. I don’t think that happens as much with lifetime sports. I’ve read a lot of research about how adults who stay fit later in life are the ones who usually play or participate in a lifetime sport. A lifetime sport is a good mental break from another sport, if the other sport is more serious and strenuous. I find lifetime sports to be very social now. At my last job, I joined a mixed doubles league and those other players became good friends. Fitness and friendship! Sounds great. Oh, and I ended up winning awards for playing tennis in college, too. When I played intramural basketball in college with the guys, everyone thought I should be playing college basketball, but I say, “No way.” I was still too burned out, very mentally, from playing under a “win at all costs” high school coach. In my opinion, it is important that children take part in several sports. Even more importantly, I think that they start early enough. Of course, they first learn sports through the game. Starting serious training too early doesn’t pay off. Sport is also important for the development of personality. The acquired characteristics can be used in other areas of life. In my blog article (http://inventorstory.com/training-pays-off/) I have described what specific personality traits I gained during the training of various sports. I completely Agree, Multisport is the way to go at least until high school. We strongly recommend our “Primary” basketball players play Soccer or Football in the fall/ spring, and Leave summer open camps or whatever they want to do. So when most read ” Play Multi-Sports” I believe they uhndersand that as meaning play a sport every season, when its in season. For example, I recommend (again primary focus basketball players) Basketball in WINTER, Baseball in Spring, Summer Open, Soccer in FALL. Where most of out kids play travel AAU basketball in Summer, but some play soccer or baseball..whatever they want. Plus Summer camps etc. 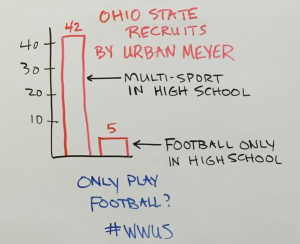 The ISSUE now is not convining Parents to be Multi-Sport, everyone is doing that. The issue is they are trying to do Multi-Sport at the same time all year round. We need to educate our parents on how this is not the definition of Multi-Sport. Absolutely pro muliti sports in this house. always have been. number 1 it keeps kids active which above and beyond all is top priority. It also keeps my kids focused and they meet friends and learn accountability towards their team. These are the reasons I put them in sports. If they become a top athlete that will be amazing. if they just develop love for fitness and a healthy lifestyle then that is just as amazing. my daughter now 8 has done dance gymnastics cheer and parkour and is now moving into lacrosse and basketball as she is huge on being in things her brother is in. that being said. she has done very well as a first time player in both sports with no background in them at all but her coaches both credited it to her flexibility, coordination and muscle memory that she developed early on with her previous activities. they said that if you know how to move your body then half the work is already done and the rest is just practice. my 10 year old son has done parkour bmx racing gymnastics basketball lacrosse and is now adding football in this year as hes loving being on a team and his coach specifically told them at the end of lacrosse season to take the season off and play other sports. get involved. we do have a winter lacrosse skills building camp that he will also be in and although his prime focus is on lacrosse he had came home and told me mom i need to go back into basketball this year cause coach says it will help me be better in lacrosse. that coach was amazing. also every kid on the team he plays for that is out there shining you can bet plays another sport. you can see them on the field in any sport from a mile away. they always dominate even at the novice level. That is why i have always been pro multi activities. cause you can see at 10 years old how much further it takes their games. and during the summer months we take a break. they do summer training camps here and there but for the most part its their off time to just enjoy before back to the grind. i find that it does a world of good to help stop the burn out. but we are still very physically active in the summer. summer has always been there time to dirtbike wakeboard waterski tubing camping fishing and swimming. and with all of that we are jam packed for the 2 months off and then good ol september it starts all over again. Cudos to all the families out there that take every waking minute of downtime they got to run back and forth from sport to sport. i know your pain as it really never seems to end but one day our kids will thank us for it. Definition of multi-sport and not all coaches on board. I have 2 girls currently age 9 & 10 who have been multi-sport alyhletws since age 4. There are medals all over the house – soccer, skiing, hockey, baseball, and figure skating. Podium and rep teams all. And, there are still dance classes – hip hop, jazz, and musical theatre. However, being able to swing a bat and maybe hit the ball once in a while and same with every sport one is involved does not make one a multi-sport athlete? There will one day be an Olympic event “multi-sport” similar to triathlon therefore, a clear definition perhaps needs to be made. Moreover, coaches of other sports need to recognize true multi-sport athletes and the demands on time required. Especially if it is a “TEAM” sport. Some coaches adamantly require the athlete to be, for example, at every practice and game to stay on the rep team. My girls are at a high level at all their sports and at their age. My job is to keep the doors open so that when THEY choose, not me choose or a coach chooses, then my girls are good to go. Recognizing true multi-sports athletes by definition needs to be made by top sports organizations and filtered down to the bottom so that these athletes could pursue THEIR dreams be in the Olympics as a multi-sport athlete or otherwise. You’re not wrong, Phil. While many of the national sport organizations now promote multi-sport participation, the philosophy that participating in multiple activities benefits all kids — whether they are future elite athletes or not — has not yet trickled down to all levels of the grass roots. But slowly, as parents like yourself ensure that children have many opportunities and sport governing bodies continue to promote the benefits of multi-sport, the message is spreading. If I died and came back as a bug, bird or some other form of life, guess where I’d like to be. You guessed it. Very near a Badminton court w/ o getting hurt. I can tell you that as a spectator my best seat was behind the court watching the elite players going all out. The blistering foot speed, racket power combined with the soft touch shots such as drops. It takes wizard like uncanny skill to change pace like that and hit the spot every time. Needless to say that these are among the fittest athletes in any sport. They possess virtually limitless stamina, durability, flexibility and mental tenacity. The sheer physical strength and dexterity is hard to define. Anyone that watches each point transition to the next, comes away in disbelief and admiration. It’s intensity is pretty much unmatched. That’s all. This is where the buck stops. It is claimed that two days a week of competitive play can increase your life expectancy by at least two years. Yes, the quality of life is also enhanced to where you are both physically and mentally more vibrant if you so engage. So I have a 14 y/o boy that has been fencing for @ 5 years. Every coach and athlete I talk to really hammers down on training and competitions if you want to be at the top. The sport focuses mostly on the back leg for lunging. With the time constraints placed on student athletes do you have any suggestions in how to incorporate a new sport while maintaining a lifestyle balance and the intensive instruction. I’m thinking basketball for hand speed and agility. Trying to look into books as well if you have any recommendations there. Thank you for your time. Ben, hi! Have you read my post here? Listen, get your son some good badminton coaching and more importantly some competitive playing time. If for some reason he doesn’t warm up to it then just the repetitive and varied motion as well as the lunges and footwork in this sport will get him tuned up for fencing/foil to a great degree. One of the best ballerinas in the country (Misty Copeland) apparently did not start studying ballet until age 13. I don’t know if she had any other dance training, but this might suggest that overall athleticism allowed her to take up dance late and become the highly accomplished dancer that she is today. Misty Copeland’s story is very intriguing as she completely contradicts conventional wisdom about ballet dancers needing to start early (e.g age 4 or 5) and then spend thousands of hours in specialized ballet-specific training before puberty. Having said that, she was apparently “dancing” on her own to popular music (e.g. Mariah Carey) prior to age 13, and this was likely critical to her early development of rhythm, balance, and coordination (i.e. all-round athleticism, as you say). I am inclined to read her autobiography “Life in Motion” to learn more about her. Have you seen the television ad that she did for Under Armour? A beautiful statement about girls not giving up — Misty received several rejections from ballet schools at age 13 because she was “too old” and had the “wrong body shape”. Check it out on Youtube. Again, to your point, she completely contradicts (and thereby disproves?) all of the conventional thinking about the development of ballet dancers — all-round athleticism seems to have prevailed in her case. I am in favor of the multi-sport participation environment for youths of any age. I am not concerned with the costs, but I do have a bigger hurdle that I am wondering if others have had to tackle. My daughter plays Ringette, and has done so, as her primary sport, since she was 6 (now in her 7th year). She loves it and is very passionate about it. She dabbled in other sports in the off season (ie soccer) when she was younger, but now refuses to play any other sport. We have been encouraging her to branch out, specifically now that she is in junior high and there are so many other sports to try. She would rather do no sport activity during the off season (although she does maintain her fitness level through other activities, including yoga, biking and inline skating) then try something new. Any advice on how to translate the long term benefits of multi-sport to the words a tween will understand and change her perspective? Thanks for the comment, Jamie. We always advocate letting the child take the initiative, so take her lead. If your daughter wants a break from formal sport programs during the off season, that’s okay. Especially if she’s staying active with yoga, biking, and inline skating. It’s not about formal sport programs, it’s about physical activities that give kids a break. So don’t think “multi-sport” as much as “multi-activity”. 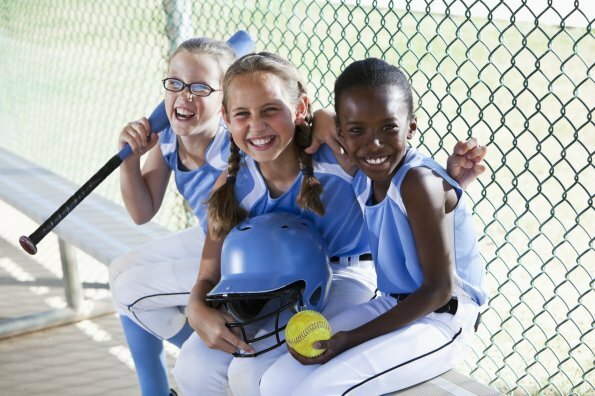 If you want to introduce other sports — she may find that she really enjoys something she’d never considered — you can do this without going the program route, too. Go to the playground with a basketball and just shoot baskets for a while. Set up a badminton net in your back yard. Throw a beach ball around in the local swimming pool. Blaine, I couldn’t agree with you more. 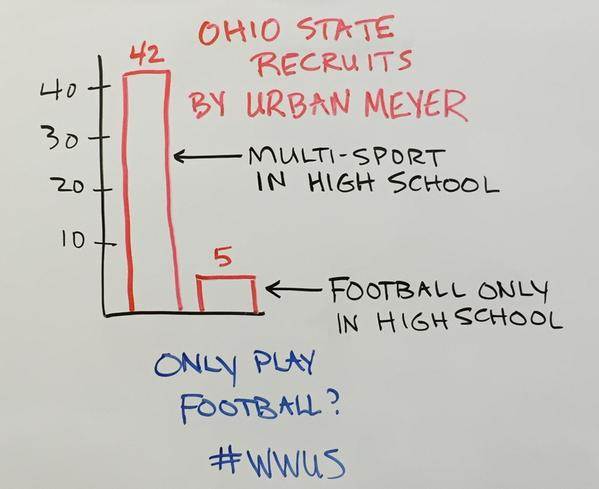 Great perspective, not multi-sport necessarily but multi activity. One thing about badminton, I need to clarify with some people. Regrettably as it stands now (today) most people’s perspective on badminton conjures up images of backyard badminton. Something I jokingly, if not snidely refer to as ‘goodminton’. We put the word ‘bad’ in Badmintton simply by taking it indoors with better equipment and play it competitively. It’s an Olympic sport rather than just a game and that distinction needs to be made very clearly, and made expeditiously. Rebecca, we’re looking for more information on whether dance qualifies as an early specialization activity. Certainly, traditional dance instruction would suggest that it is, but we’re not aware of any longitudinal studies that actually prove this. Certainly, children benefit from learning rhythm at an early age, but they can learn that by dancing for fun, which they can do at a young age. The benefit of learning rhythm, in fun activities (not training 10 hours a week from the age of 5, and not by doing rote, repetitive movements), has been demonstrated in research.